On the right kind of material, K-Stereo Ambience Recovery is an impressive stereo/ambience adjustment tool. Subtly broadens width and depth. Impressive ambience adjustment. Focuses the mix in a very musical way Mid/Side control is simple and effective. Can't 'dry up' wet mixes. Ambience Gain knob counterinuitive. Some controls go further than is needed. 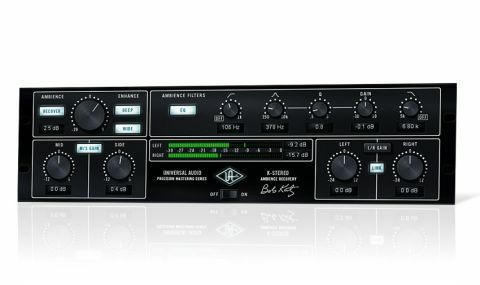 As part of UA's Precision mastering series, the K-Stereo Ambience Recovery plugin for UAD-2 systems (VST/AU/RTAS) is a joint effort with renowned American mastering engineer Bob Katz, patent-holder of the K-Stereo process. "It's useful during the mix stage for 'gluing together' samples with inconsistent audio characteristics"
It purports to use psychoacoustic methods (such as the Haas effect) to "recover and boost" ambience and subtly adjust stereo width and depth in any source material. In short, it's a tool for bringing stereo masters into cohesive focus. It's also useful during the mix stage for shaping individual stereo elements, such as a string section or choir, say, or 'gluing together' samples with inconsistent audio characteristics. Although there are four distinct elements to this plugin, the primary one is the Ambience Recovery section. Engaging this gives you the power to raise the apparent levels of the ambient aspects of a stereo master using the Ambience Gain pot. You can further enhance the ambience by adding extra width and depth, though that side of things uses just single on/off switches rather than adjustable amounts. The Ambience Gain is 'zeroed' at 12 o'clock. You'd be forgiven for thinking that this is therefore a neutral, 'flat' position that can be turned down to decrease the ambience level and up to increase the reverb, but it doesn't actually work like that. The centre setting establishes an 'ambience level' considered optimum for most sorts of music, which seems a little strange when you reflect on the fact that ambient levels are surely unique to every mix. Reading between the lines, what it gives you is the point at which you can hear something start to happen, and it does do something pretty impressive around that point. Below ten o'clock, you probably won't hear any change, and beyond two o'clock the transients start to blur. Between the two, though, you can pinpoint a sweet spot where the dimensions of your stereo master become clearly defined and the picture draws into focus. The aforementioned Wide and Deep switches help to enhance the picture further by expanding those dimensions in terms of left-to-right and front-to-back perception. "Used carefully and conservatively, it can pull a stereo master into clear, cohesive focus"
The Ambience Filters section enables you to shape the tone of the "recovered" ambience without affecting the original source material. It comprises high- and low-pass filters and a parametric band ranging from 150Hz to 10kHz. This section is particularly helpful when using a high Ambience Gain level: the high-pass filter helps to contain any low-end waffle, while the low-pass averts the transient blurring up to a point, and the parametric band is used to accent the ambient feel - warmer, harder, harsher, more brittle, etc. The final L/R Gain section not only sets the final output level but can also be used to correct any minor stereo imbalance in the source material when unlinked. As stereo enhancement plugins go, the Precision K-Stereo is certainly up there with the best. Used carefully and conservatively, it can pull a stereo master into clear, cohesive focus, precisely gluing together those all-important musical interrelationships. What it can't really do, however, is reduce the ambient levels of an overly wet mix. Ultimately, for those who understand the subtle art of detailed mix-finessing, what it does do is most useful.